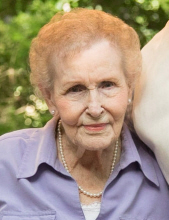 Cherryville - Mrs. Gladys Mae Glover, 89, of Ridge Avenue, formerly of Stockton, California, went to be with her Lord on Thursday, February 7, 2019 surrounded by her family. Mrs. Glover was born in Springfield, Missouri on March 18, 1929 a daughter of the late Ralph Evans and Mattie Jones Evans. In addition to her parents she was preceded in death by her husband Thomas Glover, Sr. and her step mother, Goldie Evans. Survivors include her daughter, Pamela Miranda and husband Tony of Cherryville; a son Thomas Glover, Jr. of Oregon; four grandchildren, Jennifer Johnson (Billy), Anthony Miranda (Ashley), Frank Miranda (Liz), and Anastasia Glover; four great grandchildren, Kylie Johnson, Madison Miranda, Jessica and Monica Johnson; a brother, Phil Evans of Stockton, CA; three sisters, Judy Stewart of Oklahoma; Mary Han and Ruby Schwinden both of California; also survived by her little dog and best friend Molly. Stamey-Cherryville Funeral Home & Cremation Service is serving the family of Mrs. Glover. To plant a tree in memory of Gladys Mae Glover, please visit our Tribute Store. "Email Address" would like to share the life celebration of Gladys Mae Glover. Click on the "link" to go to share a favorite memory or leave a condolence message for the family.